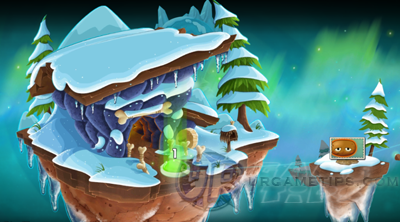 Here's the 1st part of the quick walkthrough and strategy guide for the "Frostbite Caves" stages in the strategy defense game - Plants vs. Zombies 2: It's About Time! Grab your parka! 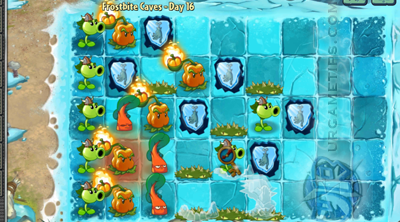 Chill out in 16 prehistoric levels with frosty features like ice blocks, freezing winds and hot new plants, sure to melt frigid zombies. - Play Big Wave Beach Quick Walkthrough and Strategy Guide first before this guide! - Use it on frozen plants or enemies to instantly melt them. - Will blow and briefly freeze all zombies on the lane, can be used at the back of zombies. - Lobs flaming peppers and keeps nearby plants warm, best placed on the 2nd column. - Knock-backs enemies in-front but will consume 1 leaf. Can be planted over it to regenerate it's leaves (PF can also do this). - Blue Labeled Plants: Frozen given plants by default. Melt and use them as your bonus plants, replace if fallen (optional or no need to add or replace). 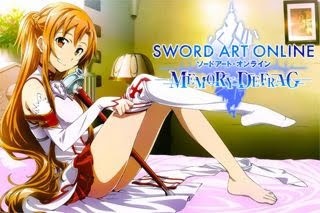 - For this stage, just learn how the ice blocks works. Frozen plants will gradually melt when attacked (cherry bombs will instantly melt them), beware though because zombies can pass through frozen plants. Iced blocks or tiles will redirect zombies towards where the zombie hand is pointing, so make sure to focus your defenses on that lane/s first. - PF: Snapdragon vs group of tough zombies. - Hot Potato: Use it on iced Repeaters to help melt plants in-front of them. 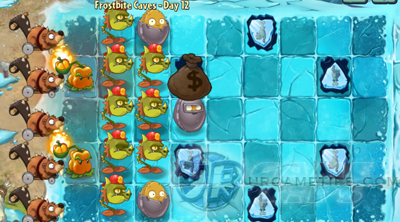 - Peashooter and/or Repeater: Place it at the back of those ice blocks, but for the first 2 lanes, place 1 Repeater each. Start from the top lane first. 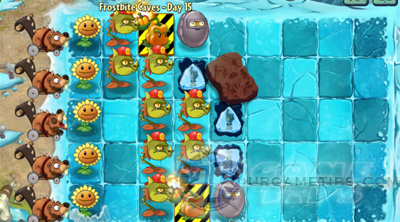 - Spikeweed: Place them in front and above those ice blocks, start from the top lane first. - Hurrikale: Place it on the top lane to protect your single Repeater, effect will still work if placed at the back of those zombies. - PF: Top Repeater since all attacks will come from this lane. - Kindly refer to the "Important Reminders" above on how to properly place Snapdragons. - Just reserve and replace fallen plants. - PF: Pepper-pult or Snapdragon vs group of zombies. - Hot Potato: Use it on iced Sunflowers to get fast Sun early on. - This time, focus your first Snapdragon on the 3rd lane first. - Cherry Bomb: If needed vs group of zombies. - Hot Potato: Use it on those iced Split Peas. - Deploy all available plants you have, or just always free up space. - Hurrikale + Potato Mine Combo: Use Hurrikale on heavily raided lanes (attacking your Wall-Nuts) then quickly deploy a Potato Mine/s to hurt them once they come near again (or vice versa). - Potato Mines: You can also deploy them on lanes that doesn't have any zombies. - Wall-Nuts: Place another Wall-Nuts over them to restore their Health. - PF: Snapdragons vs tough zombies or Dodo Rider Zombies. - Quickly deploy 2 Sunflowers, then 3~6 Snapdragons, continue placing both plants. - Wall: vs tough zombies coming your way, to protect your Snapdragons early on. - Cherry Bomb or Blover: vs Dodo Rider Zombies (only if flying). - PF: Threepeater vs heavily grouped zombies, or to regenerate Chard Guard. - Chard Guard: Once they consume all of their leaves, plant another one on top of them to let them regenerate. Note that PFs can also do this. - Threepeater: Once they show up, replace all 6 Peashooters on the 2nd, 3rd, and 4th row. - PF:Snapdragons: vs heavily grouped zombies. - For the 2nd lane, place a Chili Bean in-front of those frozen zombies before you place your Snapdragons here. - Chard Guard: Regenerate them once they run out of leaves. - Cherry Bomb and Chili Bean: vs heavily grouped zombies. Use Chili Bean on lanes that doesn't have Chard Guard. - Hot Potato: Use to unfreeze your plants. - PF: Wall-Nuts, then Snapdragons vs heavily grouped bucket zombies during final wave. - Hot Potato: To help unfreeze your plants. Always watch this out, especially your Wall-Nuts. - Cherry Bomb: You have 1 free shot, use it during the final wave. - PF: Save all 4 PFs, then use it on Pepper-pult and/or Snapdragon vs Sloth Gargantuar. - Wall-Nut: Deploy to protect your Snapdragons early on. - Cherry Bomb or Chili Bean: vs heavily grouped zombies and Sloth Gargantuar. - Hot Potato: To unfreeze your plants. - PF: Any to protect your plants from hitting zombies. - First, use Hot Potato to unfreeze the Split Pea, then sell it to get extra Sun. Deploy 2 Pepper-pults on the 2nd column near those Sunflowers to unfreeze them all, then sell all 4 Sunflowers placed on the 2nd and 3rd column. - Defend the center lane with a Bloomerang and 1 Chard Guard while doing the above method. - Hurrikale: vs zombies hitting your Bloomerang. - PF: Wall-Nuts, reuse or regenerate if necessary. - The above formation is enough, add any plants you like next. - Cherry Bomb or Chili Bean: Use if necessary. - PF: Repeater vs Sloth Gargantuars (needs 2 PFs each), or heavily grouped zombies attacking your 1st column Repeater (if they can). - Put all Repeaters on the 1st column, then place Pepper-pults or Repeaters at the left side of the Ice Blocks, they are safe there. Take note of the 3 Pepper-pults on the 2nd column too, make sure you have them to keep your nearby plants warm. - Spike Weeds: Place them in-front of your Chard Guards (bottom 2 rows only), then below or at the right side of the Ice Blocks.